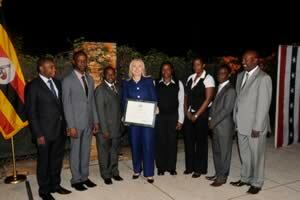 Secretary of State Hillary Clinton on Friday honored gay rights activists in Uganda with the department's 2011 Human Rights Defender Award. The secretary said she raised the issue of discrimination based on sexual orientation with Ugandan President Yoweri Museveni. Clinton made her remarks at a reception in Kampala as she continued her 10-day trip across Africa. “I've said before it is critical for all Ugandans – the government and citizens alike – to speak out against discrimination, harassment, and intimidation of anyone. That's true no matter where they come from, what they believe, or whom they love. And no one has been a stronger champion than all of you. You've been organized, disciplined, and savvy. You have marshaled the evidence and made the arguments using the rights enshrined in Uganda's constitution and in international law. And by doing so, you are a model for others and an inspiration to the world,” she said. Among those recognized were Adrian Jjuuko, Geoffrey Ogwaro, Julius Kaggwa, Joanita Warry Nambirige, Clare Byarugaba, Frank Mugisha, and Hassan Shire Sheikh, according to a State Department press release.